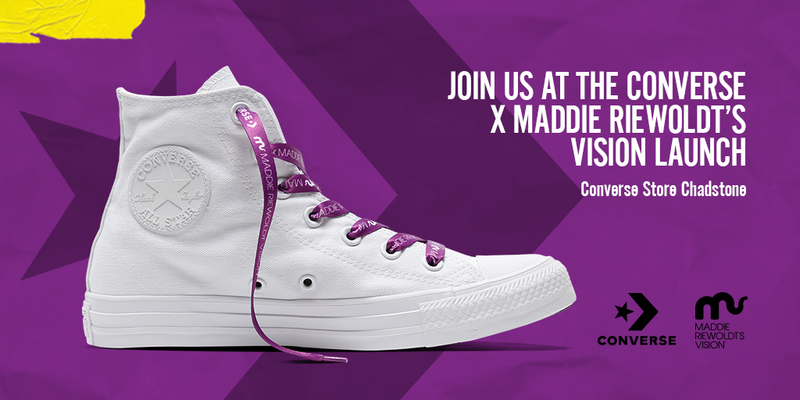 Converse and Maddie Riewoldt’s Vision have partnered for the third year to create a limited-edition range of footwear. The 2018 Converse Chuck Taylor All Star X Maddie Riewoldt’s Vision sneakers, on sale in September, are designed primarily in vibrant appealing white with the popping signature purple lace. 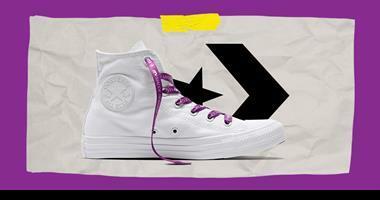 Converse will donate forty dollars from each pair purchased to find a cure for Bone Marrow Failures Syndrome (BMFS). To date, Converse have raised $40,000 and in 2018, have doubled the amount to be donated from each sale to accelerate their support for vital research into BMFS. After the success of the past two years, Converse have committed to evolving the partnership with new designs and due to the huge popularity with families, will continue to include adults and kids sizing in this year’s range. Converse, the most iconic and recognisable sneaker in the world, creates a vehicle for Maddie Riewoldt’s Vision to reach an enormous community. The exclusive designs are fast becoming collectables amongst our valued supporters, sporting icons, fashion influencers and personalities. Support from the likes of Rebecca Maddern, Jess Hart, Sam Wood, Brendan Fevola and the Riewoldt family suggests the exciting new range will again be seen around the world from September. We will be launching this new and exciting range at the Converse store in Chadstone Shopping Centre. Please join us on Saturday, the 8th of September between 3-5pm, where you can enjoy a special treat, get snapped with your new pair in our GIF booth and have your MRV sneakers personalised by laser engraving! Maddie Riewoldt's Vison is dedicated to finding a cure for Bone Marrow Failure Syndromes (BMFS) and was founded by the Riewoldt family following Maddie’s tragic death in February, 2015. Maddie Riewoldt’s Vision has been a galvanizing force in elevating awareness and raising substantial funds towards purposefully identifying and supporting the best researchers in Victoria. BMFS mainly affects young people, like Maddie, aged 17 to 40. About 160 young Australians are diagnosed with the syndromes every year. Sadly, more than half will die from the disease. Bone Marrow Failure is complicated so it’s often misunderstood by the public and research into Bone Marrow Failure is grossly underfunded. Bone Marrow Failure is more common among adolescents and young adults aged 17 - 40 and cruelly impacts the lives of those living with the condition every single day. Professor David Ritchie, a Haematologist and Bone Marrow transplant specialist at the Royal Melbourne Hospital, Board Member of Maddie Riewoldt’s Vision and Maddie’s doctor for her seven months in hospital explains: “Put simply, the bone marrow is a complex organ and one that is as vital and as critical as the heart. Bone Marrow Failure syndromes are a collection of medical conditions where the bone marrow stops working – resulting in abnormalities of the blood including severe anaemia, increased risk of severe infections and bleeding. "All Bone Marrow Failure syndromes are due to a failure of the bone marrow stem cells and may be acquired (affecting a previously normal marrow) or inherited. Bone Marrow Failure syndromes occur when the bone marrow cells have been damaged or have been attacked by the immune system."